Your Providence College experience will challenge you. The Liberal Arts Honors Program (LAHP) takes it a step further. For more than 50 years, PC has invited a select number of students into this academically rigorous program. Exclusive opportunities to fulfill core requirements, advanced multimedia and writing projects, and independent research are hallmarks of the Honors experience. The LAHP also has a distinctly interdisciplinary focus. You’ll take classes with expert faculty across PC’s academic departments and study side-by-side with biology, French, finance, and theatre majors — and many others — in your Honors classes. Together, you’ll share seemingly divergent ideas and find surprising connections. LAHP not only takes students to the next level academically, it also takes them out into the community and around the world — where what’s studied in class truly comes to life. 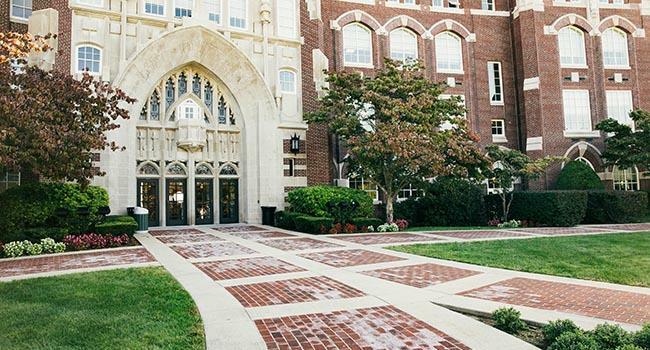 Students admitted to Providence College and invited to the Honors Program will receive notification in about a week of his/her acceptance to the college. Honors students are free to major or minor in any academic area they choose. We are proud of the mixture of interests in our Honors classrooms. Students must take a minimum of six Honors courses in four years, though most opt to take more. Honors students take one or two classes together per semester. Other courses are taken with PC’s greater student population and selected from the College’s general offerings. There is no separate housing for Honors students, and participants are fully integrated into the residence life and extracurricular activities of the College. To remain in the Honors Program, students must maintain a cumulative GPA of 3.25 or higher. Approximately 130 students are invited to the Honors Program each year based on academic success: rigor of high school courses and GPA, essay, recommendations, and standardized test scores (if applicable). We understand that you might have additional questions about the Liberal Arts Honors Program. If so, please click here to see answers to some of the most frequently asked questions we receive. The Liberal Arts Honors Program hosted Truth and the Liberal Arts Symposium in October, 2016.